Real Housewives of Beverly Hills star Lisa Vanderpump quit as Editor-in-Chief of Beverly Hills Lifestyle Magazine. Lisa took to her Instagram to announce it. The RHOBH star noted that she’s so busy with lots of projects she had to step down due to time constraints. Rumors that Lisa may quit Real Housewives of Beverly Hills are circulating around the internet. The possibility arises, as Lisa mentioned in her post, “the complicated tempest that is life.” After all, her Vanderpump Rules show, plus several restaurants and bars keep her busy. Additionally, she runs the Vanderpump Dog Foundation, dabbles in wines, and more. In fact, it may surprise some people that she acted as Editor-in-Chief for Beverly Hills Lifestyle Magazine. Now she’s stepping down, Lisa’s fans step up in support, as usual. @abbydurz said to her, “you will forever be my idol ? ?.” Meanwhile, @indyelectwifeali posted, “Endless Respect for you as a woman, mother, and businesswoman.” One fan hoped that she wasn’t leaving because nasty people try “ganging up” on her. That probably arose from another report saying that the RHOBH cast ganged up against Lisa Vanderpump. It is a bittersweet announcement but, after an incredibly fulfilling reign as Editor-in-Chief of Beverly Hills Lifestyle Magazine, I am stepping down and resigning my position. I have had a wonderful time helming the creative aspects of this magazine, and I am so proud of the issues we have produced but, due to the turns my life has taken and the complicated tempest that is life, I no longer feel that I can dedicate the time to it that it needs. Our family has many projects happening in the near future that we are excited to announce soon, and I wish @BHLmagazine nothing but success. It has been a delight to be your Editor-in-Chief! 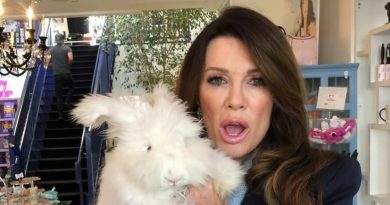 What do think about Lisa Vanderpump quitting as Editor-In-Chief of Beverly Hills Lifestyle Magazine? Do you think she may also quit RHOBH? Check in with Soap Dirt often to stay in touch on Real Housewives of Beverly Hills spoilers and news.